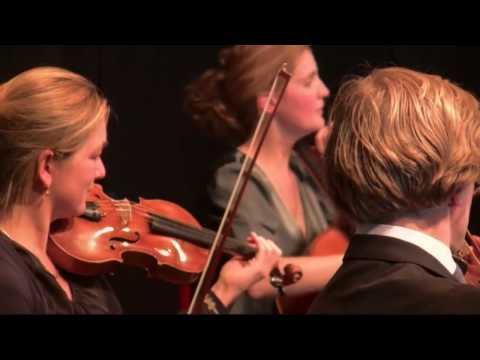 Camerata RCO is a unique ensemble comprised of members of Amsterdam's renowned Royal Concertgebouw Orchestra. These colleagues founded this independent group with the desire to explore smaller more intimate repertoire. The ensemble performs frequently in the Netherlands and abroad, and has residencies in Spaarndam, Dordrecht, and at the Festival Amfiteatrof in Levanto, Italy. Tours have taken them to New York, Minsk, Tokyo, Seoul, Vienna, Rome and Madrid. Camerata RCO has recorded five well-regarded albums featuring music by Mozart, Mendelssohn, Corelli, and Mahler. In November 1771, during his second Italian tour while in Milan, Mozart wrote his Concerto ò Sia Divertimento (the title is written on the autograph by his father Leopold) in E-flat major. Mozart used clarinets for the first time in this beautiful lighthearted piece. The way of writing for the clarinets is still very different from the way Mozart would write for clarinet in his later years. In this work, the clarinet is treated more like a small clarino (trumpet). Later, after returning to Salzburg, Mozart changed the instrumentation of the winds, replacing the clarinets and horns, by oboes, English horns and bassoons. This may have been because the orchestra in Salzburg did not have very good clarinetists at the time. Mozart wrote his serenade KV 388 in 1782 for the wind ensemble of the Emperor. The piece has 4 movements, which is quite unusual, since at the time, serenades usually contained 5 or more movements. Also, the character of the piece is more serious and profound than for example KV 375 or the Gran Partita KV 361. Mozart must have liked his C minor serenade, since he reworked the piece into a string quintet in 1788. Mozart's string quintets are among his most significant compositions in the field of chamber music. Mozart offered manuscript parts for subscription in April 1788, in order to have three quintets (KV 515, KV 516 and KV 406) edited. Eventually, Artaria edited KV 406 in 1792 - one year after Mozart's death. At the end of September 1781, Mozart started to work on a serenade for two clarinets, two horns and two bassoons. The premiere of this piece took place at the home of the sister-in-law of court painter Hickl on the 15th of October 1781. It was 'roundly applauded'. The same day, the piece was performed in two more places in Vienna. Two weeks later, on Mozart’s name day, 31st of October, in the evening at 11 pm, the musicians sneaked into the courtyard of Mozart’s house with a surprise performance of the piece, pleasing the composer very much. Mozart later wrote to his father that the musicians were: 'poor fellows, but fine players, especially the first clarinetist and the two horn players'. Mozart put in 'quite some effort' in writing the piece, because Herr Von Strack, would attend the concert. Von Strack was the main advisor of Emperor Joseph II for musical matters. Mozart reworked the piece later for octet (he added two oboes). "The Library of Congress series brought Camerata RCO, whose members are players in Amsterdam’s Royal Concertgebouw, a fixture on shortlists of the world’s greatest orchestras.... This was a satisfying evening of sophisticated, expressive music making with a precision ensemble as snug as the pieces of a jigsaw puzzle."